A new Electronic Health Records (EHR) system needs a huge investment in software. But the implementation of the software will cost a practice or any other healthcare organization much more than the cost of the EHR system itself. Just like the big organizations do before any big tech project, the healthcare practices should get an accurate picture of the expected potential ROI before adopting a new Electronic Medical Records (EMR) software offered by the top EMR Vendors. 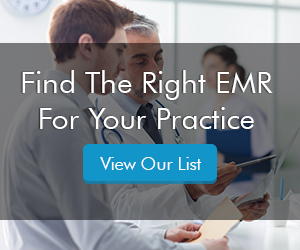 There is no doubt that an EMR system has many benefits for the practitioners, like higher patient satisfaction, streamlining of routine tasks, competitive advantage over other providers etc. which come with EMR software installation. But EMR implementation also comes with many costs that the organizations did not even plan for. To have an accurate idea of ROI and properly allocate a budget, these organizations must watch out for those additional costs. While switching to an EHR software solution for the first time, practices and healthcare organizations need to make large investments in technical equipment. But these are not necessarily the only IT investments the providers will have to make. Upgrading networks to make EHRs accessible at all times, increasing internet bandwidth etc. require additional costs. We all live in a time where hackings and security breaches are very common. Patient’s health data is supposed to be kept very confidential. That is why healthcare providers must invest in new security systems to make sure that all the data is protected and is in compliance with HIPAA regulations. So investing in security systems is an additional expense. After being trained on security, the doctors, nurses and support staff of the practice needs to get trained good enough to use the new EMR software system. In addition to this initial training, the organizations will have to spend on training doctors, nurses, and employees that will be brought into the organization in the future. Every organization needs to customize their Electronic Health Records (EHR) Software & Practice Management (PM) software system according to its needs, which will cost extra whether the provider pays the software vendor or the IT staff. Also before adopting the EMR software solution, healthcare organizations must also consider their upgrade plan for the future. This includes both software and hardware upgrades. Switching from paper records to EMR Software is a huge change for healthcare organizations. It takes some time to get used to the new system. It can even result in a significant drop in efficiency and a temporary need to increase staff may also arise which will cost a fortune. Because of all these unplanned costs, the organizations can exceed their budget and in some cases, the EHR implementation can fail even before it is completed. That is why the healthcare organizations must carefully plan for all these foreseeable costs and should be prepared to deal with them.